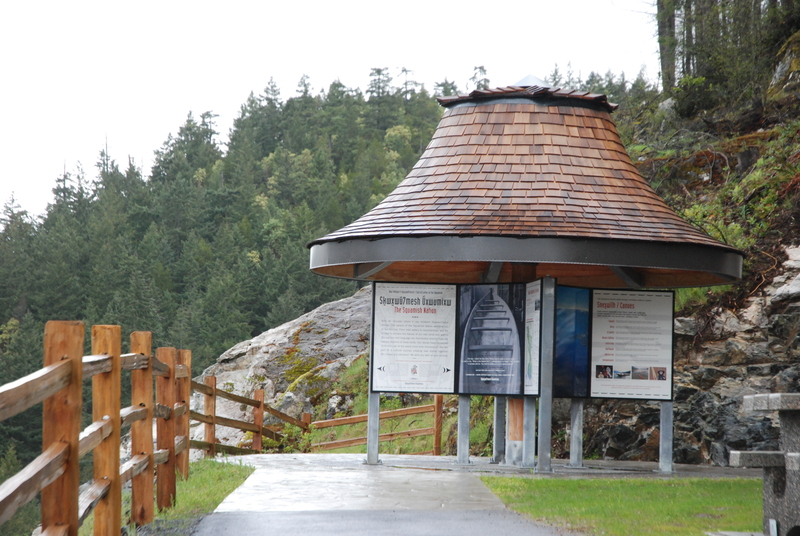 Figure 1: This kiosk above Horseshoe Bay is one of seven information kiosks along the Sea-to-sky Highway. Inspired by Quentin Mackie’s recent blog post, rave reviews from friends of the Squamish Lil’wat Cultural Centre, and several recent drives to Whistler, I set out to explore the Cultural Journey along the Sea-to-sky Highway between Horseshoe Bay and Whistler (route map; pdf). The journey is comprised of seven kiosks, each at a pull-out. Five of the kiosks are on the highway northbound and the other two are on the highway southbound. The kiosks are covered by a Coast Salish style cedar hat and each one has four 3-part sides (Figure 1). 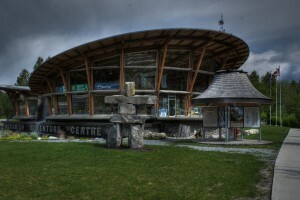 Two of the sides, describing the cultural journey and directing travelers to the Sqaumish Lilwat Cultural Centre in Whistler, repeat themselves. The other two sides are devoted to local oral history and mythology, archaeology (@bobmuckle, @qmackie), traditional culture, and contemporary Skwxwū7mesh (Squamish) and/or Liĺwat7ul (Lilwat) culture. 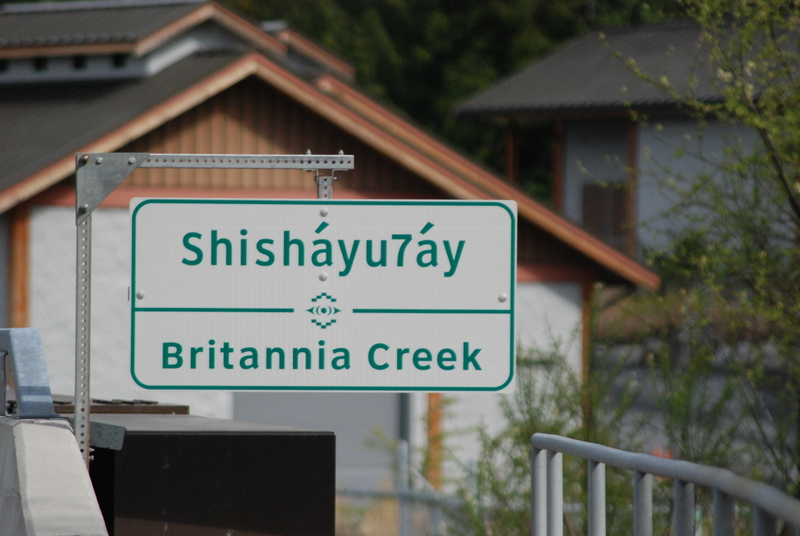 Given that the Sea-to-sky Highway runs through Squamish and Lilwat territories, and territory shared by both of them, the signage project testifies to an enormous amount of cooperation between the two communities. Figure 2: A series of signs, consistent with Ministry of Transportation signs, line the highway. 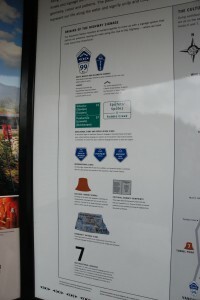 For me, the most significant aspect of this cultural journey are the signs that line the Sea-to-sky Highway (Figure 2). Using colours and proportions consistent with Ministry of Transportation highway signage, these creek crossing signs and mileage markers are notable because they don’t stand out as add-ons to existing markers (Figure 3). 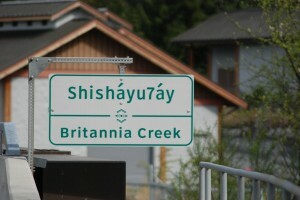 The signs look official and authentic and, as such, present the Skwxwū7mesh (Squamish) and/or Liĺwat7ul (Lilwat) languages on equal footing with English all along the route. Figure 3: Creek crossing signs use standard provincial highway colours and shapes. Figure 4: Kiosk and Inukshuk at the Squamish Adventure Centre. Thanks to Squamish Lilwat Cultural Central general manager Drew Leathem who spent some time with me explaining the enormous process of bringing together the highway sign project. Reference note: Many of the story boards and archival photographs used on the kiosk sign boards are published in a book called Where Rivers, Mountains and People Meet (Spo7ez Cultural Centre and Community Society). This book, and an associated DVD, present the history and the contemporary cultures of the Squamish and Lilwat peoples. The book and DVD were developed as part of the Cultural Journey project and are available at the Cultural Centre. Related post: Skwxwū7mesh Liĺwat7ul Cultural Centre. This was written by Tad McIlwraith. Posted on Friday, April 30, 2010, at 4:08 pm. Filed under First Nations, History, Language, Symbols, Teaching, Traditional Knowledge, Vancouver, Websites. Bookmark the permalink. Follow comments here with the RSS feed. Both comments and trackbacks are currently closed.